DailyMail have been on this guy and until this pikin confess whether na true or not, the media giant will just keep poking and poking. 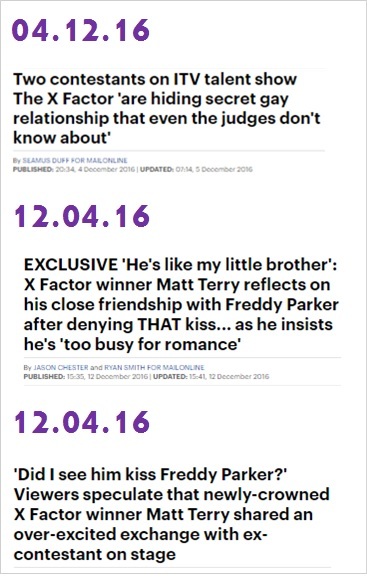 DM picked up this talk that X factor 2016 winner Matt and Freddy Parker (who got evicted in week 2) are sitting on a tree, k.i.s.s.i.n.g. They are trying to make the boy confess which he is unlikely to do (that’s if he is o) because if those small pikins wey imagine this guy as their future husband hear say na person like himself he like, well lets just his concert will be empty. But wait o, Judge Nicole – every young boy’s dream – is forever trying to flirt with this guy and he runs the other way, no blow kisses, nothing. In the video below – (precisely from 3.44mins) – another contestant Gifty Louise gives Freddie a congratulatory hug, why now? 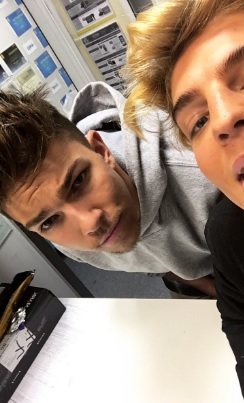 And can I just say Freddie looks so smitten/in love in their pictures – many of which has since been removed. Who knows sha, maybe the guy is just in touch with his feminine side and loves girls really.